The Chinese Nationalist Party governed most of mainland China from 1928 to 1949. 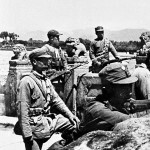 Led by Chiang Kai-shek, the nationalists lost control of China to communist forces under Mao Tse-tung in 1949. After the communist victory, approximately two million Chinese nationalists evacuated to the island of Taiwan. 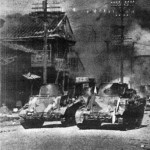 Along with British forces, nationalist Chinese troops occupied portions of Vietnam immediately after World War II.